U.S. Presidential Candidate Mitt Romney, the self-named savior of the Salt Lake 2002 Winter Olympic Games, has attracted broadsides from British politicians with tactless remarks about London’s readiness for the Games – from London’s Mayor Boris Johnson as well as from Prime Minister David Cameron. “Mitt Romney wants to know whether we are ready,” Johnson continued according to Evening Standard’s homepage. “We are ready. The venues are ready. The police are ready. The security is ready. The velodrome is ready and Team GB are ready. We’re going to win more gold, silver and bronze medals than you’d need to bail out Greece,” said Johnson. 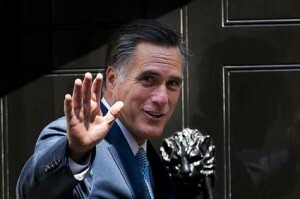 Republican presidential candidate Mitt Romney in London for Olympic Games. Senior figures in all three political parties suggested they had not been overwhelmed by Romney in person and were disappointed by his Olympic gaffes. Hosting a series of major pre-Olympic events before meeting Romney, Prime Minister Cameronwas quick to show his disdain. “We are holding an Olympic Games in one of the busiest, most active, bustling cities anywhere in the world. “Of course it’s easier if you hold an Olympic Games in the middle of nowhere. Inevitably you’re going to have challenges.” This, according to The Times, was seen as a swipe at Salt Lake City, as Cameron went on to refer to his recent trip to Naypyidaw, the deserted new capital of Burma. This article appeared in the blog, The Sport Intern, which is published by Karl-Heinz Huba in Lorsch, Germany. Mr. Huba can be reached via email at ISMG@aol.com. The article is reprinted here with permission from Mr. Huba.